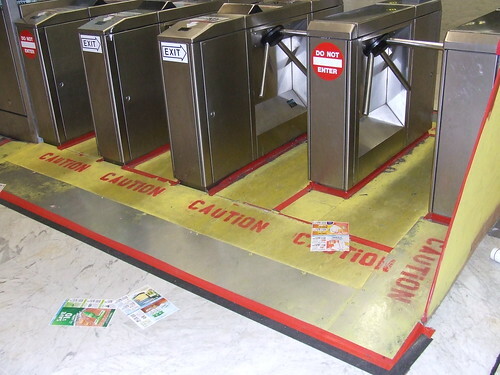 Thanks to a tip from Streetsblog San Francisco, new fare gates are being installed at the Civic Center Muni station. I took a couple of photos the changes being made on a Sunday (when they are not working) to show the future placement of the gates and their vending machines. The new gates and RFID vending machines are being made by Cubic Transportation Systems. Cubic is the company who also made the Muni fare box for their vehicles, and the latest generation of BART fare gates and ticketing machines. Here's a sample of what the new Muni fare gates will look like (PDF document) and the vending machines (PDF document). What is known about the new fare gates and vending machines is it will be solely dependent on TransLink. The gates will surely accept TransLink media, but it is not clear if they will still accept the magnetic striped media of the paper passes. The vending machines should be able to do add value just like the current fleet of add value machines installed around all the Muni metro stations, and they will also be issuing "limited use" RFID cards made from paper from the vending machines so passengers can use the ticket to enter the metro and transfer to any Muni vehicle by tagging the ticket. From my knowledge, there's no exact timeline of completion for this project, but I have e-mailed the SFMTA for more information and will update this blog posting as necessary. Cable Cars are also getting prepared with TransLink technology as well. 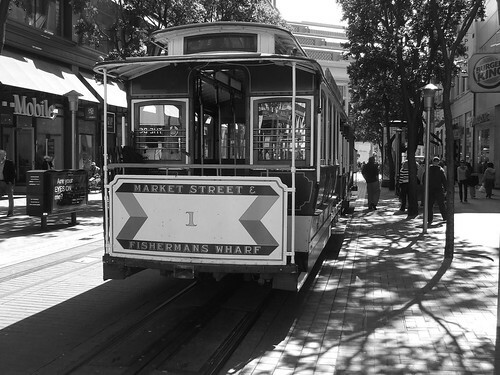 Since historic monument status means the city can't install the TL equipment on the Cable Cars, the conductors who collect the cash fares have been issued the handheld readers. Just yesterday, I noticed a conductor having a PDA like device in a holster on his right side. I should have asked the guy to try it out on my card that has a monthly pass. 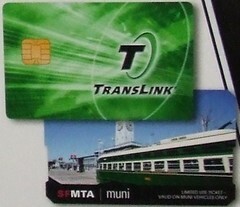 Since Cable Cars are part of the "premium" services that an adult "A" fast pass will give unlimited access to (sorry "M" users), the card readers must be in operation no later than August 1, 2010 since the paper "A" passes will be eliminated in favor for TL/Clipper cards. I am wondering if the temporary use cards are going to be RFID. I can't think of any other city in the world that uses RFID cards that are disposable - most you pay a deposit and keep it. Looking at photos from the faregate demonstration at Van Ness Station, I noticed that there is a slot that could be used for magnetic tickets. I think the system may be very similar to the Boston T, which uses magnetic tickets as well as smart cards (Cubic also did the Boston T). My CharlieTicket from Boston looks like a similar shape to the SFMTA card on that poster. They are going to use paper RFID cards for "limited use" purposes, say someone can buy an electronic day pass or just a simple basic fare and it comes with an automatic e-transfer. The Seoul subway uses RFID cards for their single-use tickets. They do require a 500 KRW (50 cent) deposit, which you can quickly and easily get back from the automated machines at each destination station. Of course, SF is not Seoul.